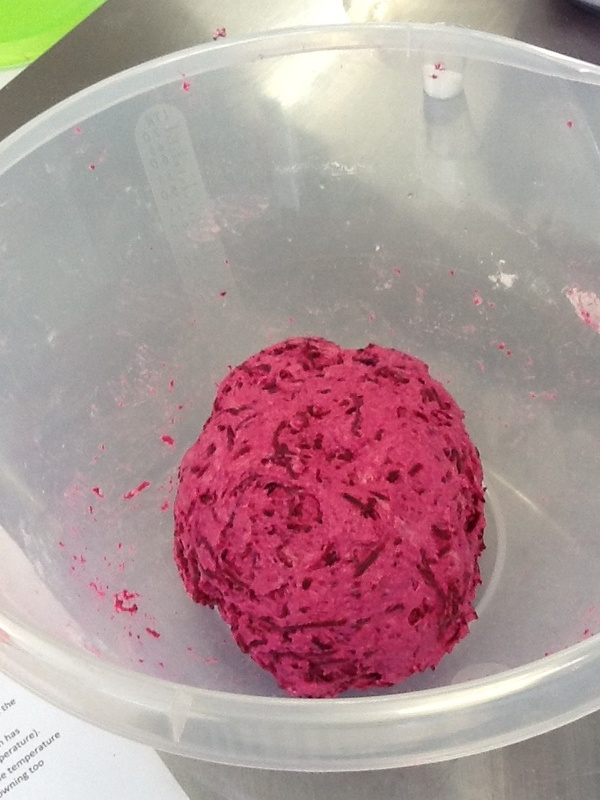 Mix the yeast and water in a large bowl then add the flour, oil, Beetroot and mix together well to ensure there is no dry flour at the bottom of the bowl. Leave for 10 minutes (or up to 30 mins). Cover the bowl with a tea towel to prevent the dough drying out. Add the salt and “fold” the dough 30 times (pulling the outer edge in and I find turning the bowl at the same time easiest) leave to rest for 10 minutes. 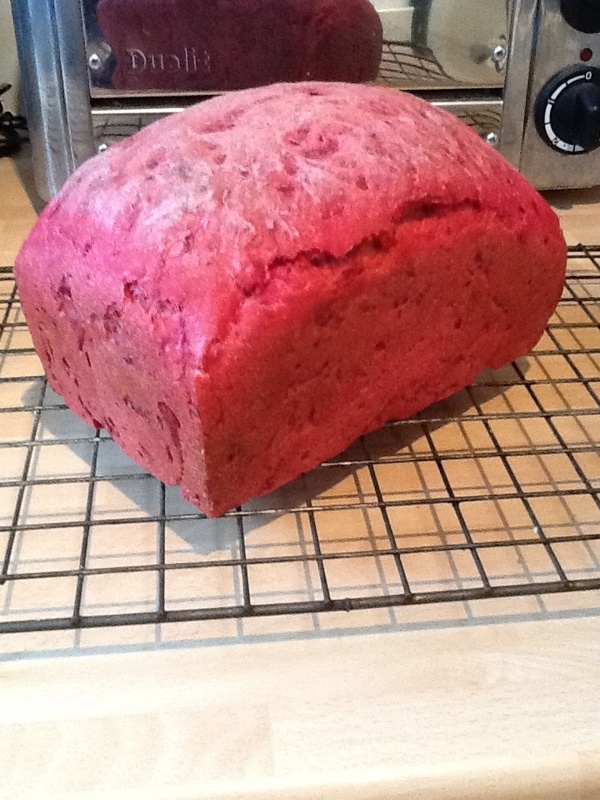 If it is sticky don’t be tempted to add more flour. Repeat the folding and resting until the dough has been folded 4 times. Rest for 30-40 minutes. Place the dough on an oiled surface and stretch out to an oblong shape. Bring the top third down and fold the bottom up over the top like folding pastry. Turn the dough 45 degrees and repeat the stretch and fold. Return the dough to the bowl and rest covered for 30-40 minutes. 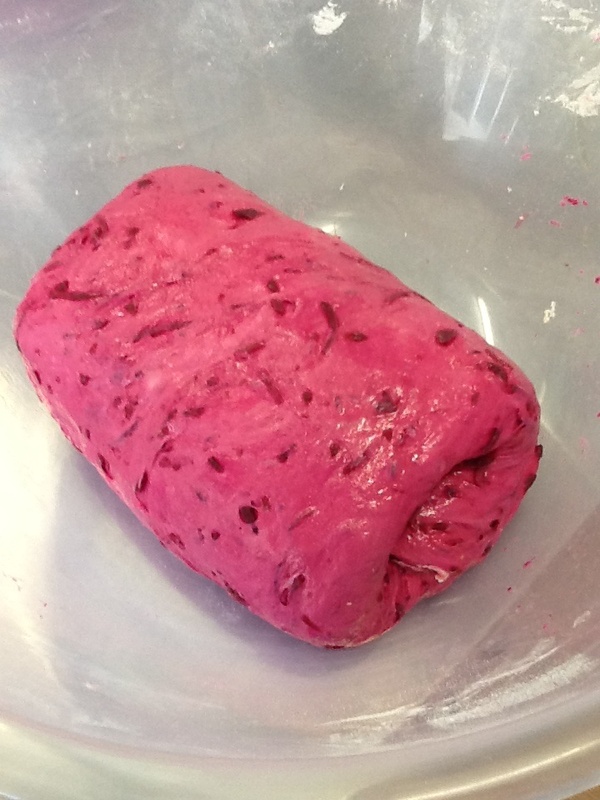 Turn the dough out onto the oiled surface again and shape into an oblong again and fold – turn 45 degrees and then gently roll into a size to fit your oiled loaf tin. Cover with a tea towel and leave in a warm place until the dough has reached the top of the tin (about an hour depending on temperature). Bake in a preheated oven at 250 degrees C for 10 minutes. Reduce the temperature to 200 C and bake for another 30-35 minutes. If the loaf is browning too quickly cover with a double piece of foil. Turn out of the tin onto a wire rack to cool.